International flights, including Delhi Kathmandu and domestic flight Pokhara to Kathmandu. 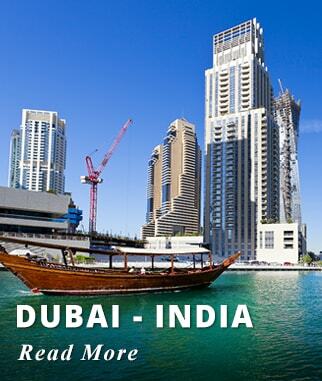 4* accommodations in Delhi, Agra, Jaipur, Kathmandu and Pokhara with breakfast daily. 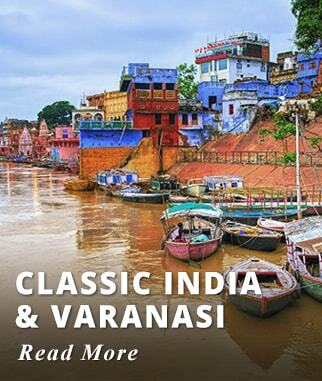 Sightseeing highlights: City Tour Delhi, visits to the Taj Mahal, Agra Fort, Fatehpur Sikri, Jaipur's Amber Fort, Jaipur's City Palace, and Jaipur's Jantar Mantar. 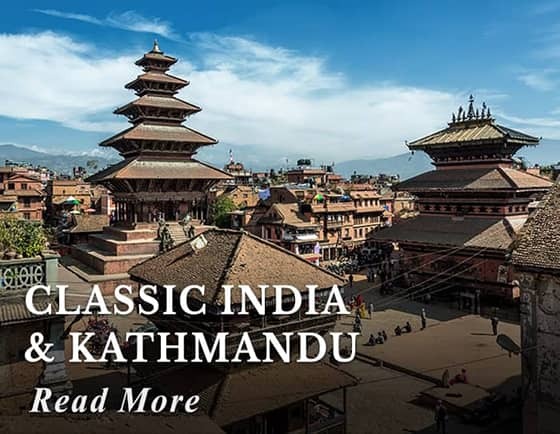 Visits to the most important Temples, Squares and Stupas in Kathmandu including Durbar Square, Kumari Ghar, and Swoyambhunath Temple. Pokhara City Tour including Visits to the Bazaar, Pasupatinath Shrine, Devils Fall and Bouddhanath Stupa. Also included visits to the ancient City of Patan, Village of Sarangkot, Pewa Lake, and Gupteswore Cave. Our prices include entrance fees, all transfers, and all taxes there are no hidden costs. 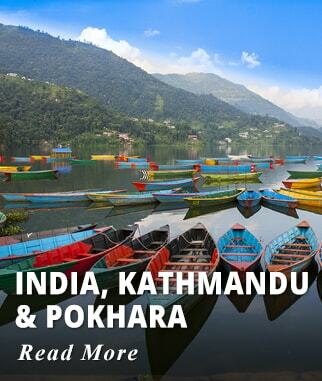 International flights, including Delhi Kathmandu and domestic flight Pokhara to Kathmandu. 4* accommodations in Delhi, Agra, Jaipur, Kathmandu and Pokhara with breakfast daily. All departures are guaranteed, we offer small groups from 2 to 15 passengers. Our prices include entrance fees, all transfers, and all taxes there are no hidden costs. Prices are valid for daily year-round departures from now until March 31, 2019. Other departures are available from USD 200 up and extra. Weekend departures add USD 90 per person. Prices are per person based on double occupancy. Single Supplement $999 USD. 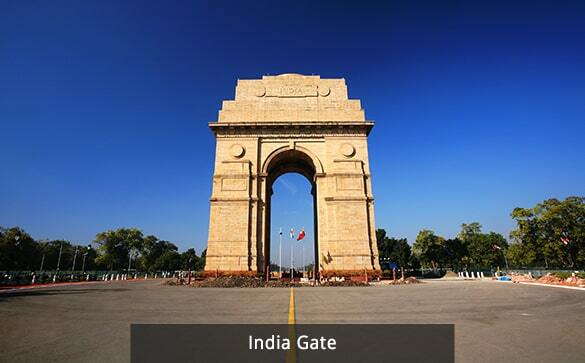 Welcome to the Indian Capital New Delhi, full of historical treasures and an abundance of things to do. 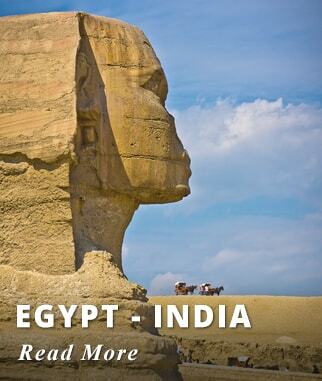 Prepare yourself to be amazed by this international metropolis home to 13 million people. Our guide will assist you with the transfer to your Hotel. Accommodation: 4* Radisson Blue New Delhi Dwarka. Qutab Minar Complex: Built to call for prayer in 1193 India's tallest Minaret stands at a height of 72 m, made of red sandstone and marble, together with the Quwwat–Ul–Mosque on the northeast of this UNESCO HERITAGE SITE, they represent a good example of India's beginning of Islamic Rule. India Gate: In the heart of New Delhi built to commemorate the Indian soldiers who lost their lives in World War I fighting with the British army. Parliament House: A very unique circular building that houses all the ministers. Secretarial Building: Actually two beautiful symmetrical buildings that house India's Cabinet. Walk down through Chandni Chowk, the old marketplace of Shah Jahanabad & now a picturesque bazaar. Raj Ghat: A memorial to the Father of the Nation, Mahatma Gandhi. Red Fort: 2 Kilometers of massive red sandstone walls with many attractions within, another great example of beautiful Moghal Architecture. It is from one of the main entrances (the Lahore Gate) at this Fort that the Indian Prime Minister addresses the nation at Independence Day. 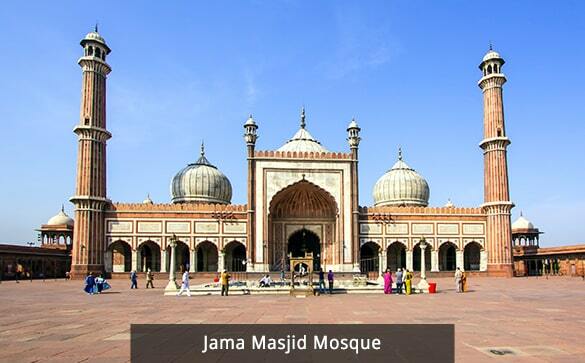 Jama Masjid Mosque: The largest in India, built by Mughal Shah Jahan, who also built the Taj Mahal and the Red Fort. 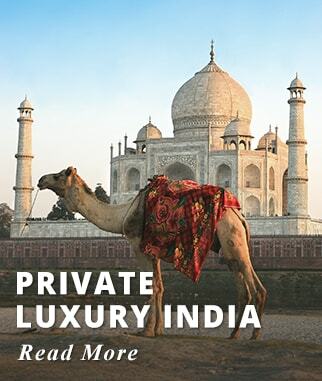 Later your Guide will drive you two hours along the new Taj Express Way to the City of Agra, Capital of the Mughal Empire. Upon arrival your Guide will check you in at the 4* Radisson Blue Agra Taj East Gate, a comfortable hotel just a short walk from the Taj Mahal. Evening at leisure. Overnight Agra. Accommodation: Four Points by Sheraton Agra. Activities included today: City Tour of the Old and New Delhi. Travel by road to Agra. 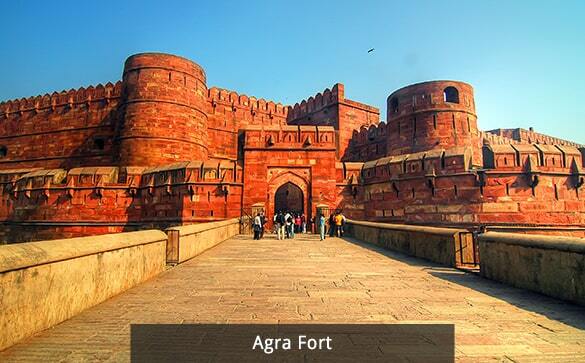 Agra Fort: Built in 1565 this impressive Fort has 2.5 km long of enclosure walls, inside are two beautiful Mosques made of white Marble: the Pearl Mosque and the Nagina Masjid. Imprisoned by his son within the walls of the Fort, Emperor Shah Jahan had a view of this beloved wife's Mausoleum from a balcony in the Musamman Burj Tower till the time of his dead. 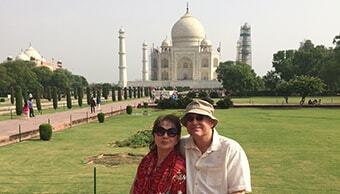 Activities included today: Visits to the Taj Mahal and Agra Fort. Fatehpur Sikri: A Unesco World Heritage Site, originally the City's name was Sikrigarh, named Fateh (Victory) after being taken over by Emperor Akbar in the second half of the 16th Century. It is a complex of Royal Palaces, courtyards Mosques and various buildings, this complex is one of the best preserved examples of Mughal architecture in India. Within its walls is the Jama Masjid Mosque, one of the largest in India. Upon arrival in Jaipur, our Guide will assist you with check in at your Hotel, the 4* Four Points by Sheraton, located in the heart of Jaipur. Accommodation: 4* Four Points by Sheraton Jaipur. Activities included today: Travel by road from Agra to Jaipur, on route visit to Fatehpur Sikri. 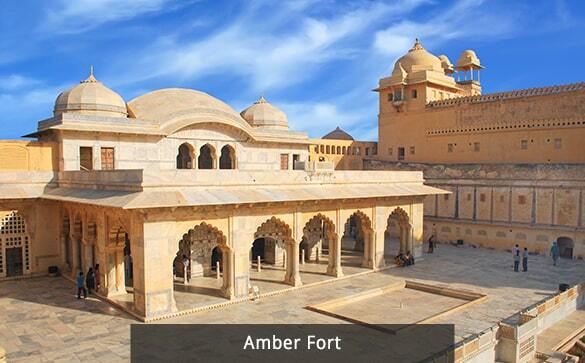 Amber Fort: Travel by elephant up the hill where the Fort is located. Built in 1592 by Maharaja Raju Man Singh is one of the most popular attractions in Jaipur, a beautiful Palace Complex of red sandstone and marble that combines Hindu and Rajput features. Jaigarh Fort: Also known as Victory Fort, is located on a hilltop overlooking Jaipur, you can get some great views of the City from here. Is one of the most well preserved military structures from the time of Mughal and Rajput rulers, inside is the largest cannon on wheels in the world. City Palace: Built in the 19th century this Palace is an imposing combination of Mughal and Rajput style, it was constructed in the heart of the City by Maharaj Sawai Jai Singh, most of the Palace is a Museum hosting a very interesting collection of weapons, and royal customs. Jantar Mantar: This site is something you might not expect to find on your tour, an astronomical observatory, built in the early 18th century is a collection of instruments built on the ground, here you find an equinoctial sundial, various other sundials, meridian and hemispherical measuring instruments, and others that measure celestial latitudes and longitudes to name a few. Check in at your Delhi Hotel. This morning you will be assisted with your transfer to the airport for your flight to Kathmandu. Meet with our representative for assistance on arrival at Tribhuvan International Airport and transfer to Hotel. Accommodation: 4* Radisson Hotel Kathmandu. 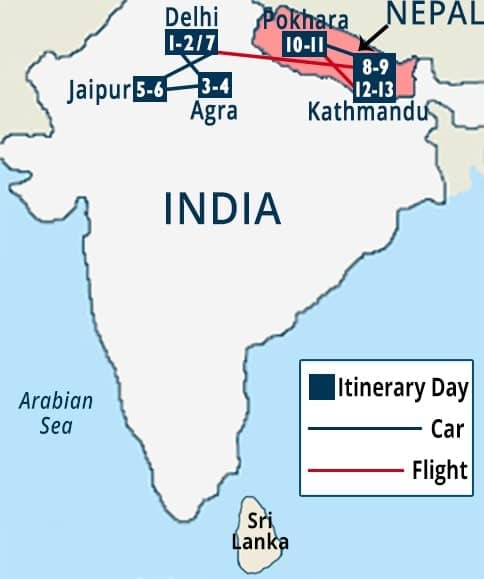 Activities included today: Travel by air from Delhi to Kathmandu. 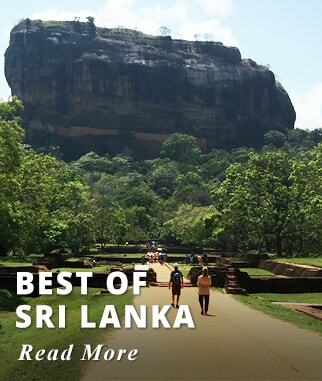 Enjoy a day of sightseeing in this ancient City. Tour of Swayambhunath (UNESCO World Heritage Site) - Swayambhunath literally means 'Self-Existent One'. Swayambhunath is believed to have been established more than 2,500 years ago by King Manadeva. It is also known as the Monkey Temple as there are holy monkeys living in parts of the temple in the North West. 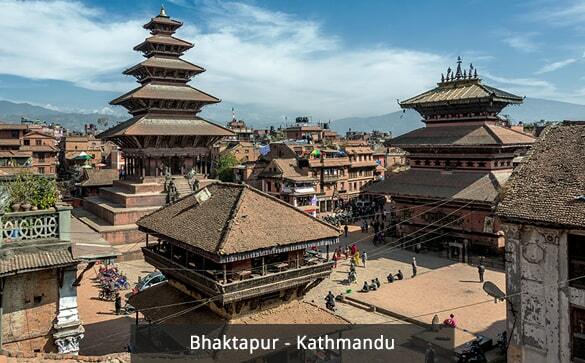 Later, visit Kathmandu Durbar Square, located in the heart of old city Kathmandu. There are around 50 temples in the vicinity. In this tour, we visit the 17th Century Durbar complex, Hanuman Dhoka, Paravati temple, great Bell and Drum, Bhairav and Taleju Temple. Visit Patan, the old Newar city, you will see the historic Durbar Square, the Golden Gate, the sky piercing temple of Taleju and the statue of Yogendra Malla, Krishna Mandir, Sati Temple, Hiranya Varna Mahabiar (the golden temple), and Mahabouddha with views of old carved wooden windows through the streets. Also, you will proceed to visit the Tibetan Refugees Settlement. Learn about Kumari, or Kumari Devi, is the tradition of worshiping young pre-pubescent girls as manifestations of the divine female energy or Devi in Hindu religious traditions. The word Kumari, derived from Sanskrit Kaumarya meaning "virgin", in Nepali and some Indian languages. Early morning, Mountain Flight, This tour offers the closest possible aerial views of Mount Everest, Kanchanjunga and the Tibetan Plateau. Twice the size of the Alps, their sheer immensity is mind-blowing. Mountain flights appeal to all types of travellers and have become a popular tourist attraction in Nepal. The 45-minute flight offers an incredible panorama, and you can take a photograph of the world’s highest mountain from the cockpit. Activities included today: Kathmandu City Tour. Today we drive to Pokhara from Kathmandu (200 Km/6 hrs. approx.) a great opportunity to discover the country side and learn about the daily life of the Nepalese people. Arrive in Pokhara & transfer to hotel for check in. Pokhara is a remarkable place of natural beauty situated at an altitude of 900 M from sea level and 200 km west of Kathmandu valley, the city is known as a center of adventure. The enchanting town has several beautiful lakes and Offers stunning panoramic views of Himalayan peaks. The serenity of the lakes and the magnificence of the Himalayas rising behind them create an ambience of peace and magic. In the evening visit The Old Bazaar, Pokhara's traditional bazaar is colorful and so are its ethnically diverse traders. In its temples and monuments can be seen ties to the Newar architecture of the Kathmandu Valley. Located about 4 km from Lakeside, the market's original charm is alive and well. This area is strewn with shops selling commodities ranging from edibles and cloth to cosmetics and gold. This is a pleasant and shady spot to stroll around. Accommodation: 4* Pokhara Grande Hotel. Activities included today: Travel to Pokhara by road, Evening visit to the Old Bazaar. In the early Morning: Transfer to Sarangkot for sunrise and Annapurna range view. At an altitude of 1592 meters, this mountain sits north of Pokhara overlooking the valley and Fewa Tal. Sarangkot is a beautiful village best known for its sunrise, where on a clear day you can see an unobstructed view of the Himalayan Mountains, Annapurna range, Dhauligiri, and Fishtail. Continue with a half day tour of Pokhara City including Devil's Waterfall, also known as Devin's and David's. Legend has it that a trekker (Devin, David) was washed away by the Pardi Khola and mysteriously disappeared down into an underground passage beneath the falls. Gupteswore Cave: One of the largest caves in Pokhara dedicated to Lord Shiva. Visit to old bazaar of Pokhara valley and Tibetan refugee camp. 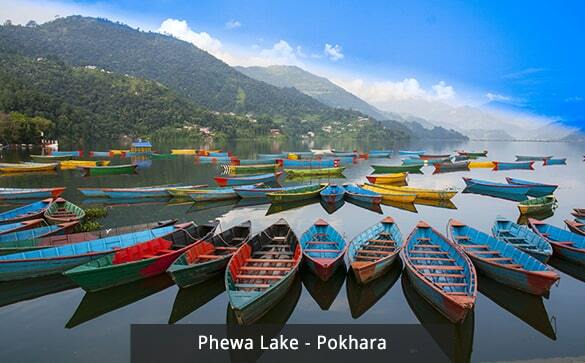 Phewa Lake: The central attraction in Pokhara is the Phewa Lake - the second largest lake in the Kingdom. 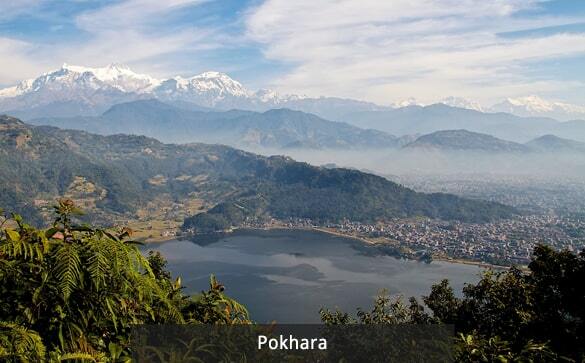 It is the largest and most enchanting of the three lakes that add to the resplendence of Pokhara. Afternoon Tea at Raniban Retreat center, Pokhara, Raniban has the best view of the Himalayan panorama, the great Fewa Lake, and Pokhara Valley, amidst a most peaceful location in Pokhara. Activities included today: Travel by road to the Village of Sarangkot, City tour of Pokhara, Visit Gupteswore Cave, and Boat ride in Phewa Lake. Transfer to Airport to board your flight for Kathmandu. Arrive at Kathmandu and transfer to your Hotel. This Afternoon visit Pashupatinath Temple Situated on the banks of River Baghmati around 8 km from the city, this is one of the holiest Hindu shrines. The Pashupatinath Temple is the oldest Hindu temple in Kathmandu. Dates back to 400 A.D. The richly-ornamented pagoda houses the sacred linga or holy symbol of Lord Shiva. Thousands of pilgrims from all over the world come to pay homage to this temple. 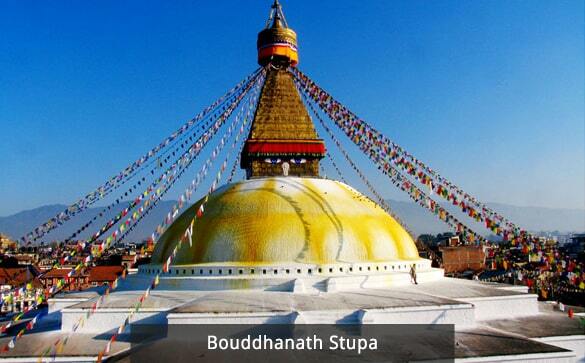 Bouddhanath Stupa: (UNESCO World Heritage Site) The centre of Tibetan culture in Nepal. 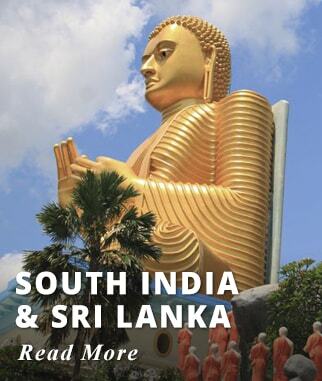 The 36-meter-high Stupa of Bouddhanath is one of the largest Stupas in South Asia. The Bouddhanath Stupa was renovated by Licchavi rulers in the eighth century. The Mandala design in Bouddhanath is a copy of the one in Gyangtse in Tibet. The stupa is said to entomb the remains of a Kasyap sage venerable both to Buddhists and Hindus. Smaller stupas are located at the base. Nepalese dinner with cultural show at Bhojan Griha, Taste authentic organic Nepalese food. Enjoy local folk dances and songs. Dining at Bhojan Griha, meaning House of Food, is a unique experience. Fascinating Nepalese cultural décor and artifacts bring past and present alive. Activities included today: Travel by air from Pokhara to Kathmandu, visit Pashupatinath Temple and Bouddhanath Stuppa. Our representative will assist you with transfer to your Hotel. 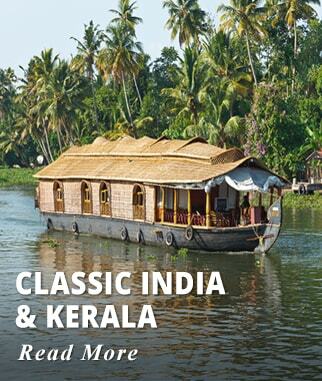 Includes International airfare from Delhi to Kathmandu. Two nights of accommodation in Delhi, at the 4* Radisson Blue New Delhi Dwarka. 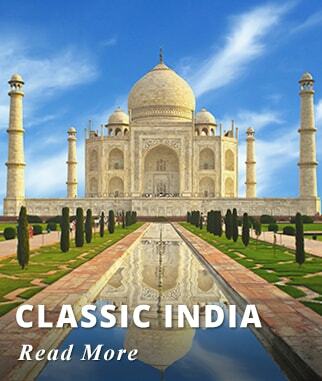 Two nights of accommodation in Agra, at the 4* Radission Blu Agra Taj East Gate. Two nights of accommodation in Jaipur, at the 4* Four Points by Sheraton Jaipur. Three nights of accommodation in Kathmandu, at the 4* Radisson Hotel Kathmandu. Two nights of accommodation in Pokhara, at the 4* Pokhara Grande Hotel. 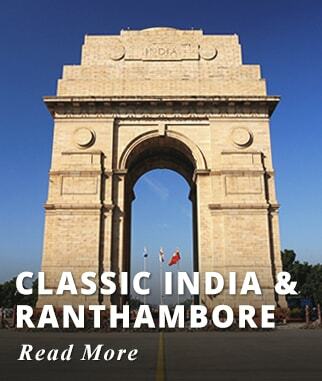 Guided Delhi City Tour, explore the Old and New Delhi. 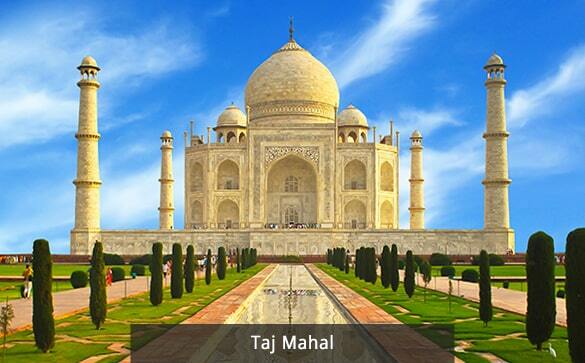 Guided Visit to the Taj Mahal. Guided Visit to the Agra Fort. 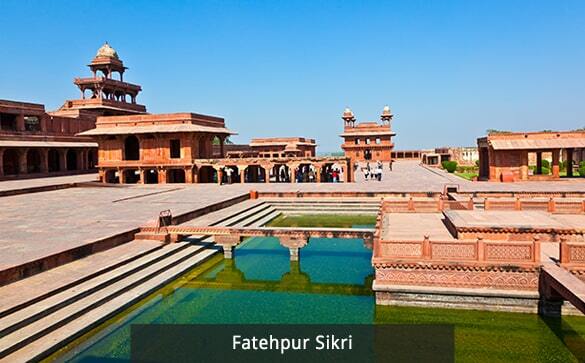 Guided visit to Fatehpur Sikri. Guided visit to the Amber Fort in Jaipur. 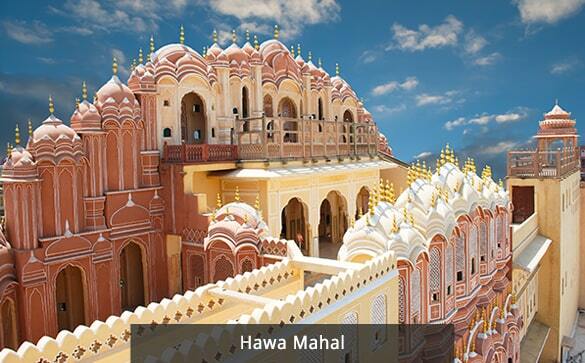 Guided visit to the Hawa Mahal known as the Palace of Winds Jaipur. 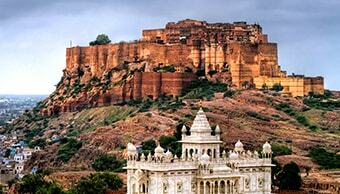 Guided visit to the Jaigarh Fort Jaipur. Guided visit to the Maharajas City Palace Jaipur. 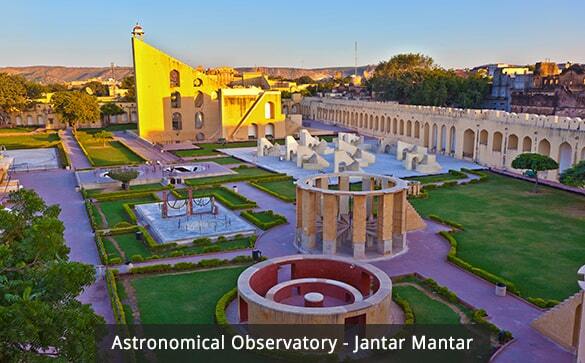 Guided visit to Jantar Mantar Jaipur's open air astronomical observatory. Guided visit to Swoyambhunath Temple. Guided visit to the City of Patan, Nepals third largest. Guided visit to Kathmandu Durbar Square. Visit the Kumari House Temple. Guided visit to the Village of Sarangkot. Guided visit to the Old Bazaar in Pokhara. Guided half day City Tour of Pokhara including Devil's Fall. Guided visit to Gupteswore Cave. Boat ride in Phewa Lake. Guided visit to Pashupatinath Shrine. Guided visit to the Bouddhanath Stupa.